While Passing through your neighborhood, you probably can’t help but notice how popular vinyl siding has become, so much that there seems like there isn’t a house without vinyl. Maybe you’re thinking about updating your old siding or are looking for a first-time purchase of brand new vinyl siding for your home. Either way, one feature to look into is insulated vinyl. 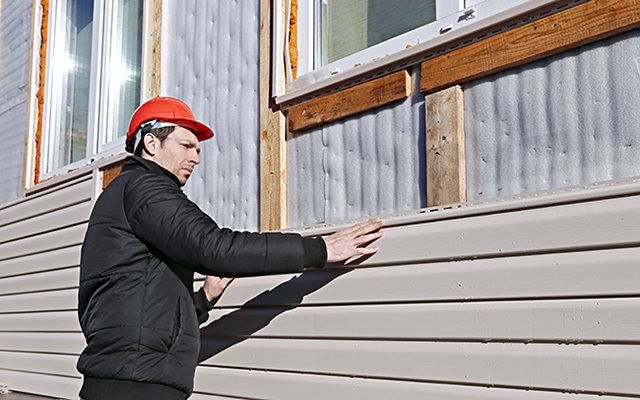 With this handy guide, you’ll learn all you need to know about insulated vinyl siding and why this innovative style of siding is the right choice for every home. You probably already know what vinyl siding is, but perhaps you aren’t sure what the differences between this and vinyl siding that is insulated. The process for manufacturing the vinyl is the same—utilizing two layers of PVC for a continuous extrusion. Manufacturers have worked out this process to be cost-effective and timely, which has contributed to vinyl material’s rising popularity since its debut on the housing market. Vinyl siding made its appearance as the premier choice of material used for siding in the 1970s. At the time, wood was primarily used for house siding, but with the American homeowners looking to find something more low-maintenance, yet durable and cost-effective, vinyl was quick to push wood siding out of the spotlight. Beginning with the obvious, vinyl siding dramatically reduces energy costs. Homes in colder climates can benefit immensely with the installation of vinyl siding, even if their home is already well insulated. Vinyl is already excellent on its own when heat transfer and energy conservation is concerned, and with insulation added beneath it, the vinyl siding becomes an even better choice of material to protect and insulate your home. Noise deadening is another excellent benefit to an insulated vinyl siding. New windows can help with deafening outside noises of traffic, loud neighbors, and cars or bikes motoring past your house, but with insulated siding, you can enhance this effect for an even quieter house. Studies have shown that insulated vinyl siding immensely reduces outside noise by 39%. The thick vinyl siding padded with insulation can make a real difference when it comes to noise, and paired with high-quality windows, your home will nearly be soundproof. You may think that having insulated vinyl siding is strictly for homes in colder environments, but this style of siding comes in handy for any home exposed to extreme temperature changes throughout the year. When the temperature drops, certain materials have a tendency to crack or become brittle, but with insulated siding, this problem rarely happens. This is because both of the house’s interior and exterior is cushioned from the downfalls of extreme shifts in temperature, so even the outside surface of the vinyl can rely on the insulation to protect it from intense heat and intense cold. For hot climates, your house doesn’t have to work nearly as hard to crank the air conditioning because the insulation keeps all of the energy inside, where it should be. Insulation is easily applied beneath the vinyl layer; If you think that selecting insulated vinyl siding will limit your options as far as style, color and aesthetics are concerned, you would be wrong. Because vinyl can be manufactured with relative ease and at a low cost, thousands of styles and colors are available at your choosing. Even if you’re after a more customized look, there is a high chance that your local siding company will be able to achieve what you have in mind and at a low cost. Unlike wood, vinyl is much cheaper, and the best part is you aren’t sacrificing any of the quality, especially when selecting insulated vinyl siding. With the extra insulation beneath the vinyl layer, you’re actually adding more to your house than you would with wood material. Termites and other burrowing pests can wreak havoc on any home no matter where you live. Certain materials sidings are composed of, like wood, are especially prone to housing bugs. Even if you’re able to catch sight of these bugs early on, it doesn’t take much for them to do damage on the exterior and even interior of your house. But with insulated vinyl siding, you don’t have to worry about discovering that bugs have weakened your home’s structure. Insulated vinyl siding adds another layer of protection against outside elements, bugs included. 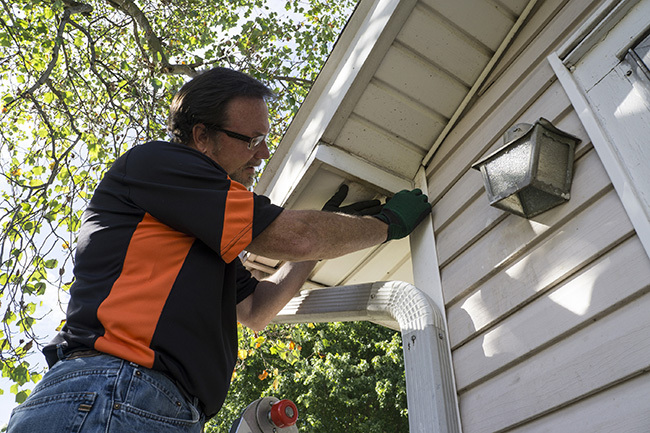 Those small insects are going to have a much harder time finding their way past the durable vinyl siding and specially crafted foam insulation to even make it into your home’s structures. That insulation sitting beneath the surface of your vinyl siding is going to last you a long time, just as long as the vinyl itself. Vinyl, as an exterior material, has a lifespan of twenty to thirty years, depending on the climate surrounding it. With other materials, like aluminum, you’re stuck having to replace panels at the slightest dent of a stray rock, debris from a storm, or accidental impact. There is a reason for its popularity and the fact that vinyl has remained popular throughout the years since its debut on the market, and that is in part due to its durability and long lasting lifetime. With the addition of insulated foam, your vinyl siding will make for an excellent investment for years to come. Increasing your resell value and curb appeal are two things every homeowner is always trying to achieve, so when you hear that with the installation of insulated vinyl siding does both of these things, it is an investment you should seriously consider, especially if this is not your forever home. Potential homeowners who are new to the housing market to veteran home-buyers who have been around the block are all aware of certain things that make a house buy-able. Energy conservation, the aesthetics of the house, and how soon they will need to replace or upgrade something of their potential home are all attributes that are considered in buying a home. With vinyl siding, especially insulated vinyl siding, your home meets all of this criterion and more. When making the decision of which siding material to go with, consider the fact that with vinyl siding, you immediately reap the rewards of an energy-efficient material that will last you decades. Vinyl siding is extremely hard and it withstands any element thrown its way, and with insulation sitting beneath it, weather, elements, noise, and energy loss are easily defeated. If you’re selling your home or planning on staying in it for a good while, vinyl siding makes living easier and selling a piece of cake. There is an array of options to choose from and with no maintenance required it is no wonder why insulated vinyl siding has remained the top-selling choice for siding since its initial feature as an option for homes across the country. As you probably learned, insulated vinyl siding is the best style for keeping your home energy-efficient, durable, and long-lasting. At Feldco Quad Cities, we have multiple color options and styles for your home. Our premium products, local services, and top quality installation make us the best home improvement company in the Midwest. Speak to a product specialist and get a free quote today.